He was 21, just a young kid from the deep woods and crystal rivers of western Oregon. Beside him were other young men just like him with similar hopes and dreams. Kids from the cities and farms, forests and rivers, deserts and canyons of America. Staying alive was a challenge. Staying sane was even harder. When Frank Moore marched over the shattered hulk of a bridge that crossed Normandy’s Sélune River on a June day in 1944, he saw something that helped him cope with the war he was in: salmon. There, swimming beneath the bridge in the middle of a battlefield, was an Atlantic salmon, a living, moving miracle. Leaning against a nearby building was a fly rod. There, swimming beneath the bridge in the middle of a battlefield, was an Atlantic salmon, a living, moving miracle. Years later and back home safe in Oregon, Moore would recount that story, remembering how much he wanted to pick up that rod and cast to that fish, as he had cast to many salmon and steelhead on his native waters in the United States. That fish in war-torn Europe sharpened his focus, made him think of home and of his new bride, Jeanne, who was waiting for him on another river of salmon. He wanted to fish, sure, but he was on a mission to liberate France from the clutches of Nazi Germany and there would be no stopping to fish until the job was done. One of the last surviving members of the D-Day Invasion, Frank served in the 453rd automatic weapons battalion of the Army’s 83rd Infantry in World War II, a group of young men who not only landed on the beaches, but fought all the way to the Battle of the Bulge and end the war on the European Theatre. Like many of his fellow soldiers in World War II, Frank Moore left a lot of his buddies behind on foreign soil. He will tell you that those left behind were the real heroes and that he was just lucky. He came back home. Back to western Oregon and back to his beloved young wife. They built a life, a family, a business, a reputation. The centerpiece of that life was a river: the North Umpqua and the business was the famous Steamboat Inn on the banks of that legendary steelhead water. Today, three-quarters of a century later, Frank is widely recognized as the dean of Northwestern steelhead fishing. He and his wife, Jeanne, are in their 90s and still find solace in the forest, the river and the fish that swim there. They have earned a living from the land and have stood up for good management of the river, the fish and the surrounding forests for all of their lives. And they’ve always fought for the river and its fish. In the logging days of the 1970s and 80s, Frank and Jeanne were disturbed by what they were seeing from the rampant clear-cuts in western Oregon. Rivers were choked with silt from soil stripped of trees. Buffers around drainages were nonexistent. Steelhead and salmon returning from the sea found their breeding grounds buried, changed, destroyed. Frank was instrumental in a documentary that showed on national television called Pass Creek and with that film and a projector, he flew in his own plane around the country, organizing anglers and others who cared about wild fish and wild rivers. In many ways, Frank was back on a battlefield again, Jeanne at his side. Now, many years after that battle and others, they are being recognized for their accomplishments and for a life dedicated to conservation of the country’s natural resources. The Moores, of Idleyld Park, Oregon, are the honorees of the Frank and Jeanne Moore Wild Steelhead Sanctuary bill that will protect 100,000 acres of critical habitat on the North Umpqua River. The proposed Sanctuary honors the life-long dedication of the Moores to the sustainable fisheries of the North Umpqua by securing habitat that will last beyond this generation to many more, and gives recognition to two genuine American heroes. It protects the sustainable resource that is one of the world’s most famous salmon and steelhead fisheries. The North Umpqua River provides some of the cleanest and coldest water in the Umpqua River drainage. In recent years, Trout Unlimited scientists and others have also been working to identify cold water resources in the Umpqua with temperature monitoring and mapping to help guide agency managers and prioritize restoration work. For anadromous fish like salmon and steelhead, cold water is life itself in an increasingly warming climate. 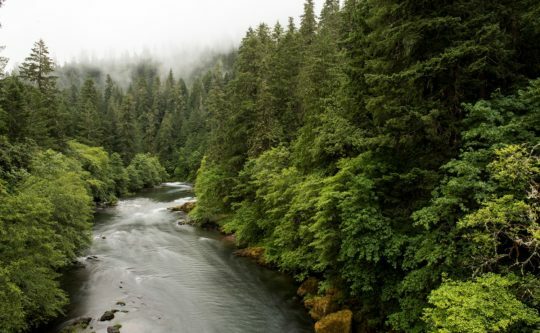 The proposed Sanctuary, coupled with science, will ensure that the river will remain as it is today, a permanently protected drainage set aside for salmon, steelhead and those who understand the importance of protected habitat for fisheries, wildlife and humans. Now 94, Frank is a very close friend with Trout Unlimited’s Dean Finnerty, a friendship that is decades old and virtually father-son in disposition. This relationship has been an incredible one for Dean and Frank, but also for Trout Unlimited. In 2016, Moore helped TU talk about the importance of public land through a film produced by TU as well as another film about the North Umpqua. The day of film production, Frank and Dean got on the North Umpqua to be filmed by Trout Unlimited’s videographer. During the filming, Frank became very emotional and shared with Dean that he had just been thinking a few days before that he would never again have the opportunity to fish the famous steelhead pools of the river. Frank has fished these pools thousands of times since the 1940s guiding clients, fishing with famous people, family and friends. 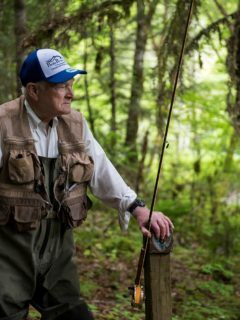 At 94, he does not feel confident wading out on the ledges to cast for steelhead in the notoriously difficult-to-wade North Umpqua. But because he and Dean needed to get the videographer some footage in support of Trout Unlimited’s public lands protection efforts, it gave the men the opportunity to get back out on the water do some fishing. Those there that day, including Frank himself, surmised that Frank would only have the strength to wade out and fish one pool. But after Frank got down in the water and started fishing, it gave him the strength, determination and strong desire to keep fishing. Frank, with Dean at his side, fished five or six pools over several hours. Frank thus became a critical part of Trout Unlimited’s public lands protection work, which includes advocating for the legislation that carries his and Jeanne’s names. Frank provided a hero’s voice to the debate over public land, bringing to others his deep personal realization as a young man fighting on foreign soil three-quarters of a century ago how important American soil was to his soul. When asked by Trout Unlimited, Frank gladly joined the cause, thus becoming a voice of “The Greatest Generation” for our public land, a legacy that echoes for generations of Americans yet to be born. 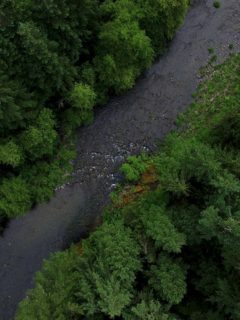 Note: Trout Unlimited has been advocating for legislation to protect the Frank Moore Wild Steelhead Sanctuary. Although Wilburforce Foundation funds are not earmarked for this work, we are grateful for all of the ways grantees like TU advocate for the protection of wild places.